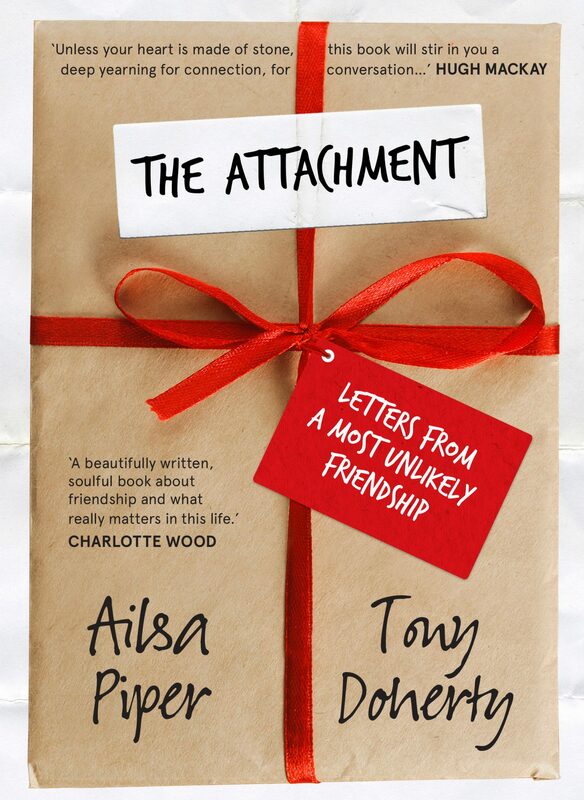 Monica Dutton reviews the newly-released book The Attachment: Letters from a most unlikely friendship – between a writer and an 80-year-old Catholic priest, both of whom have written for The Good Oil. All who accept this gentle invitation in the introductory pages of The Attachment, to travel the journey with writer Ailsa Piper and priest Tony Doherty, are reminded of the significance of story, the meaning of friendship and the sacredness of knowing. This chance meeting started when Tony emailed Ailsa in 2012 to let her know how much he enjoyed reading her new book Sinning Across Spain. The narrative recounts Ailsa’s experiences of a 1,300 kilometre walk across a pilgrim road in Spain, whilst carrying the sins of others. Ailsa replied to Tony’s email, and so, the attachment began. Themes throughout the The Attachment unfold within a series of emails between the two compañeros. Ailsa and Tony have much in common and yet, are drawn by spirited and good-humoured curiosity to exploring their points of difference. Journey, story, childhood, relationships, love and loss all find a place in the animated exchanges. Some of the emails are written in haste amid the busyness of the day, others reveal a considered and intimate sharing of deeply-held beliefs and worldviews. Writing affords the opportunity of time to formulate a reflective and nuanced response which is beyond the scope of daily, and often hurried, conversation. The rhythm of the emails is that of two pilgrims walking together for a while – they are lilting and gentle, poignant and poetic. From the red earth of the Gascoyne in Western Australia to the idyllic scenes of Sydney’s Lane Cove River, childhood memories are uncovered and shared. Physical journeys to Spain and Ireland are recounted, as are emotional, spiritual and inner journeys as themes of pilgrimage, restlessness and searching weave their way throughout the book. Both Ailsa and Tony are consummate story-tellers. Their diverse life journeys are revealed in their richness and rawness, and both understand the incomparable healing power of story. There are stories within stories, and a recognition that our personal stories form the people we are and the choices we make. Ailsa describes each of us as being a library of stories – “we are different with different people. Each of them knows a part of our story, and together, they make up the whole”. Issues within the contemporary Australian Catholic Church are addressed with honesty and integrity. The devastating findings of the Royal Commission into Institutional Responses to Child Sexual Abuse are acknowledged from the perspectives of victim, perpetrator, clergy and parishioner. Traditional religious language which is outdated and disconnected, the decline in numbers attending liturgical celebrations and the erosion of spiritual capital, reflect the current landscape and are challenged with authenticity and pragmatism. Death is a constant companion on this journey, and the place of ritual, both secular and religious, is honoured and poignantly apparent. The personal sharing of grief and loss invite the reader into a space which is all too familiar to so many, yet solitary in its encounter. A discussion of the inevitability of personal grief, and the quiet accompanying of the grief of others, provide depth and insight into experiences of sadness and loss. There is a complementarity between the sacred and the secular. Tony’s recounting of sacramentally reverencing a person after death, and Ailsa’s achingly beautiful relating of the need to tenderly brush her mother’s hair took me back to my own identical experiences with an excruciatingly heartbreaking jolt. So many of the exchanges are infused with the rawness of personal grief, and touch into a collective, yet always uniquely individual understanding of the experience. It is said relationships are our greatest teachers. Ailsa and Tony describe their friendship as an unlikely one – that of the priest and the shanachie. They speak of stopping for each other, of knowing each other even before meeting and “recognising the song in the mystery of another person”. In slowing down and walking the journey together, “the gift of friendship appears and grace waits to be found”. There is a sharing of souls and a reframing of perspectives and worldviews through an encounter with difference and divergence. In Tony’s words – “amidst the sound and fury of our life… there exists a gentle whisper of belief, a rumour of angels, a treasured story passed down by those who love us”. The Attachment centres on attentiveness to relationships and the nurturing and appreciation of those who walk alongside us. So, slow down… stop for a while… and journey with Ailsa and Tony. Take some time to discover their warmth and humour, their searching and insights – and in so doing, you may be surprised to rediscover some of your own! 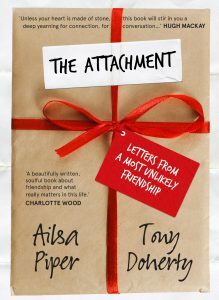 The Attachment: Letters from a most unlikely friendship by Alisa Piper and Tony Doherty is published by Allen & Unwin, April 2017. Monica Dutton has worked in Good Samaritan schools for 15 years and is currently the Immersion and Resources Coordinator for the Good Samaritan Education Mission Team. 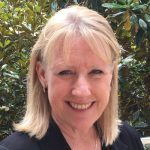 She has a particular interest in developing formation and immersion programs and resources for staff and students in Good Samaritan Education schools.